ToothFairy by Pamela Jene : I KNEAD Your Love; What I learned from my sister-in-law – YOUNG MOMMY B.A. It’s Sunday and I’m still waiting for the raw data for my report which is due tomorrow. Argh, I really hope I’d get it today because I definitely don’t want to rush myself. Anyway, how’s your weekend? I hope it turned out great. Mine was just OK. The kids are with their dad and I’m sure they enjoyed very much. The last time they spent time with him, they didn’t want to go back home. Apparently, they missed their daddy..
Oh my goodness! I was so busy, I was not able to finish my post. In fact, I forgot my topic (not really). I’m going to write about my sister – in – law. Hello dear Pam! Well, she was my brother’s best friend and no one expected that they will tie the knot. But I don’t have to tell that story here. 1) I’m tired. 2) I might lose the whole point of writing this. Nah, stick to the first reason. I’m just tired. 🙂 I’ll write again tomorrow. Or some other day. Ok, I need to finish this. My sister- in – law, I must say, is one of the most passionate persons I have ever encountered in my entire life. When she wants to do something, she won’t stop until she reaches PERFECTION. Which reminds me, her baked goodies are just so perfect, you have to try it out for yourself. You can check her Facebook Page (click the link) and choose from the yummy treats. Going back – Pam is a self- taught baker. At first, she just watched tutorial videos, baked using techniques from random bakers and asked us for comments about her goodies. It didn’t take a long time for her to create cakes and cookies that swept us away. Obviously, I’m promoting her page. But there is actually more than that. Pam taught me that passion (aside from believing in yourself) is one of the key ingredients in accomplishing milestones. Don’t let bad remarks deter you from doing what you love. Always remember that every success is accompanied by failure. Who would have thought that her hobby will pave way into a profitable business she is now running, right? What I also admire about her is that she keeps on learning. Of course, by now she is aware that she bakes great food. But it didn’t stop her from improving and honing her skills. 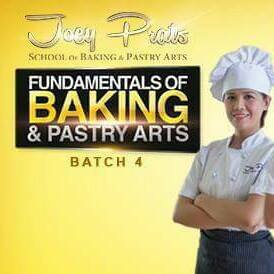 In fact, she attended Joey Prats’ baking class which skyrocketed her skills. And lastly, now I have proven that there are people who cook (or in this case, bake) from the heart. Every single time that I watch her knead and mold her dough and fondant, it’s as if she is creating a masterpiece. That’s something that I might want to do in the future (not the baking of course, but putting my heart in whatever I do). I gained weight with these! Again, check out her page, I’m banking my name on it. Oh yes! Thattt loooong review. 🙂 Nakakagutom yung review mo ha.